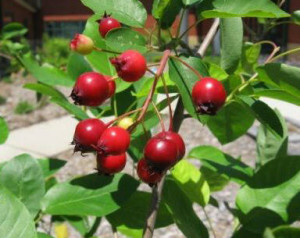 Native plants are those that occur in the region in which they evolved. By evolving in an area, native plants have acquired traits that help them adapt to local conditions such as soil type, climate and pests. Native plants often surpass non-native species in ruggedness and resistance to drought, insects and disease, requiring less water, fertilizers and pesticides. They come in many beautiful colors, shapes, and sizes, as well as are suited for many types of soils and light conditions.Native plants, trees, shrubs, ferns and ground cover offer a practical and environmentally-friendly alternative for landscaping, conservation and restoration projects. Birds love the fruits of Serviceberry or Shad Bush (Amelanchier arborea). Tree Frog on Golden Ragwort (Packera aurea, Senecio aureus). 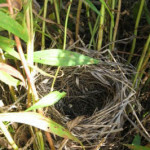 Native wildlife often depend on native species for food, shelter and nesting sites. 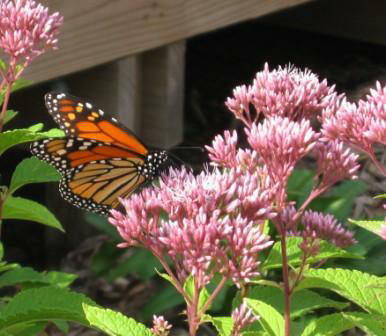 For instance, the monarch butterfly will only lay her eggs on plants in the milkweed family. Some of the milkweed plants that are found in our region are common milkweed, swamp milkweed and butterfly weed. In addition the spicebush butterfly will only lay her eggs on the spicebush (Lindera benzoin). Without these plants the monarch and spicebush butterflies would die off from lack of food for their caterpillars. 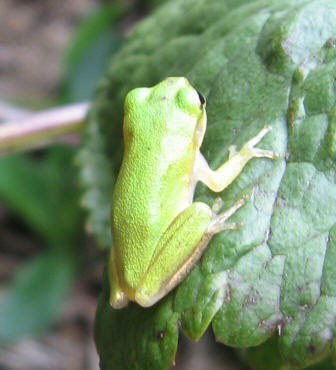 In addition, studies have shown that some non-native plants do not provide the necessary nutrients that many native species provide to local and migrating wildlife. Native plants provide nectar for butterflies, bees, hummingbirds and other wildlife; leaves and stems for caterpillars and other wildlife, and seeds, fruits and berries for birds and other wildlife. Monarch Butterfly on Joe-Pye Weed (Eupatorium fistulosum). 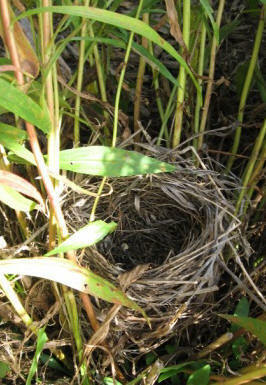 Bird’s nest in Sweet Goldenrod (Solidago odora). Native species are threatened daily by development and the introduction of invasive or aggressive non-native species into our environment. For example, English ivy is often purchased and planted as an evergreen groundcover for yards, window boxes and trellises. This plant is extremely aggressive, making it a desired groundcover, but it also spreads into nearby woods and wild areas. In addition, the seeds of English ivy are transported by birds and the wind into the wild. Because English ivy is so aggressive and is not kept in check by local pests and/or diseases, it creates a dense covering, blocking out native species that once lived there.Native habitats and the wildlife that live in them are threatened as more development occurs and more and more habitats are being destroyed. As native habitats are lost, our local wildlife is threatened by loss of food, shelter, and places to raise their young. 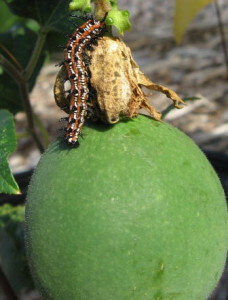 Fritillary Caterpillar on Passionflower Fruit (Passiflora incarnata). not only for our enjoyment, but for the health of the environment, the benefit of wildlife, and the preservation of native species.